Christmas is coming and the crisps are getting weird. Which is great news if, like me, you get a bit bored of the ready salted norm. Christmas is one of my favourite times of the year, food-wise, and I love using the excuse of ‘being festive’ to consume as much port and fancy cheese as humanly possible. Luckily, you can keep your taste buds jingling all the way to the big day itself with Walkers’ new range of festive crisps. This limited edition wintery offering will be available from October 15 onwards, and includes flavours of turkey and stuffing, pigs in blankets, glazed ham and cheese and cranberry. Yes! Grinches, I suppose this is a little early but nobody is forcing them down your gob. Walkers has a proven track record of launching fun and playful flavours that really get the nation talking, and this year we wanted to bring some of that magic to Christmas. We know the sprout debate is one that divides the nation, so we wanted to offer product solutions for both sides of the debate, and ask people to decide whether they’re a #SproutLover or #SproutHater. 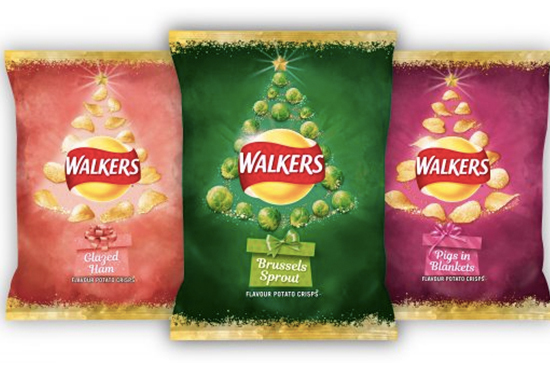 Walkers have cleverly divided their seasonal multipacks into #SproutLover or #SproutHater. The #SproutLover includes brussels sprouts, turkey and stuffing, and pigs in blankets flavours, while the #SproutHater includes glazed ham, turkey and stuffing, and cheese and cranberry flavours. The flavours of turkey and stuffing, pigs in blankets, and brussels sprouts are also available to purchase in single-serve packs, if you have yet to affiliate your side to one side of the debate or the other. Crisp fans are truly being divided, yet in the tastiest possible way. I love Brussel sprouts BUT not sure how I feel about flavoured crisps!?! For those who just want pig in blankets (and by those I mean me), Tesco are also selling their succulent pigs in blanket flavoured crisps, which – at £1 per packet – look good enough to dunk in gravy. And it appears others agree.